The story is described in all four Gospels (Matthew 27:57-58; Mark 15:42-46; Luke 23:50-54; and John 19:38-42). To cite but one, Luke wrote: “Now there was a man named Joseph, a member of the Council, a good and upright man, who had not consented to their decision and action. He came from the Judean town of Arimathea, and he himself was waiting for the kingdom of God. Going to Pilate, he asked for Jesus’ body. Then he took it down, wrapped it in linen cloth and placed it in a tomb cut in the rock, one in which no one had yet been laid”. In Books of Hours, this scene often opens the Office of Vespers of the Hours of the Virgin. 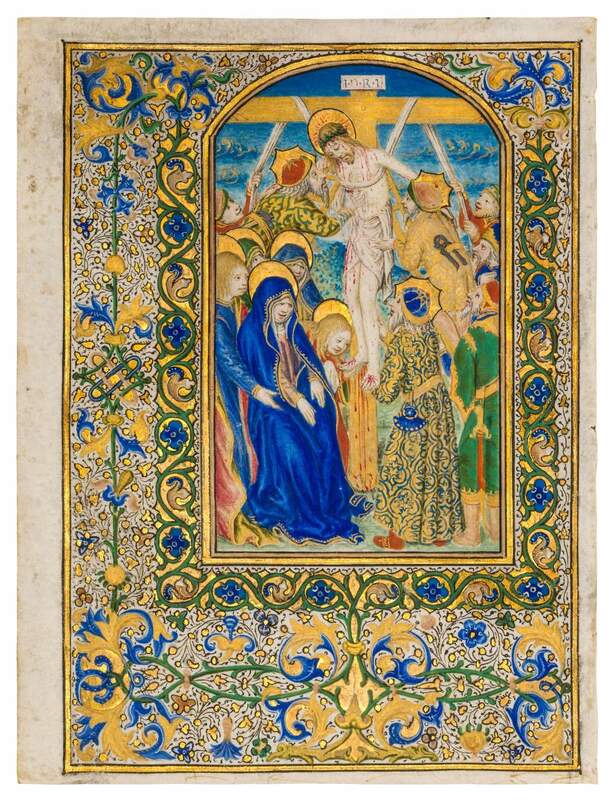 The present miniature is one of four newly discovered leaves, all of which show so many similarities with two miniatures in the Fitzwilliam Museum in Cambridge (Marlay Cuttings Sp. 1a and 1 b) that we suggest they once belonged to the same series in a Book of Hours from Spain, dismantled sometime in the second half of the 15th century. Both Cambridge miniatures were already exhibited as single leaves by the Burlington Fine Arts Club in 1886 (no. 29). The illuminations share the same style, facial types, palette, dimensions (just minimally deviating due to individual cropping) and arch-topped form. They also share a similar border decoration system at times including (groups of) figures (not here). The scenes are highlights of Valencian manuscript painting, attributable to Juan Pedro (Joan Pere) Ballester, c. 1470s. He trained and worked in the context of Valencia, where he was offered important commissions. His miniatures demonstrate a naturalistic manner of representation where Netherlandish influences permeated his work. Although Ballester’s career is mainly documented in Valencia, it shows a gap between the years 1474 and 1479 – when he may have been working in Toledo. However, his oeuvre – or the illuminations attributed to him – shows considerable variations and significant differences implying either artistic choices or the possibility that more hands were involved. New research into this captivating illuminator and his work will provide an interesting challenge.